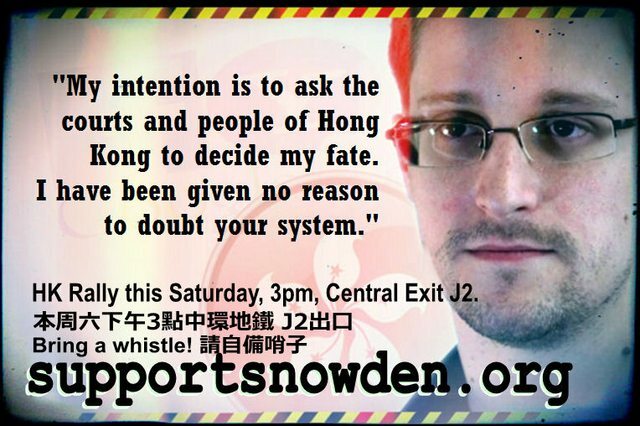 Hong Kong Rally in Support of Edward Snowden this Saturday, 3pm Chater Garden (exit J2, Central). Hosted by InMedia and Hong Wrong. See supportsnowden.org for details and bring a whistle! Over 14,000+ invited at the time of writing, but we need you to show up with your whistles! Rally tag: #snowdenhk Live updates on Twitter here. Click to tweet this event in English or in Chinese. Edward Snowden, the whistleblower behind the NSA internet and phone surveillance program has come to Hong Kong because, he says, we “have a spirited commitment to free speech and the right of political dissent”. Snowden sacrificed his personal safety and freedom to defend our right to free speech and Internet freedom. Do you want to stand for freedom and the rule of law? Or should we totally disregard Hong Kong’s legal system? This episode marks a crossroads in Hong Kong’s future. Stand up for the future of Hong Kong..
Time: 3-5:30pm, Saturday June 15, 2013. Rally route: Starting 3pm at Chater Garden, Central MTR exit J2. Rally to the U.S Consulate and then Tamar SAR government building. Rally preparation: Please bring your friends, prepare for rain and try to bring water resistant posters. Bring a whistle. Slogan suggestions: “Defend Free Speech, Protect Snowden”, “No Extradition”, “Respect Hong Kong Law”, “Shame on NSA”, “Stop Internet Surveillance”, “Betray Snowden = Betray Freedom”. ABC News (USA), Al-Jazeera, The Standard, Sing Tao, SCMP, SCMP poll, The Guardian, interview with ABC Australia, AFP (reproduced in many outlets e.g. Channel News Asia, Pakistan Daily Times, Fox News, Bloomberg etc…). Event tweets from Glenn Greenwald, Naomi Klein. This entry was posted in Blog Events News: Activism and tagged blog events Politics: Activism snowden on June 12, 2013 by Tom Grundy. Is there any suggestion that the HK legal process be circumvented? What he did is clearly an unlawful use of a computer (and would also have been an offence under HK laws, not least Cap.521 Official Secrets Ordinance). And what that means is for the courts to decide, based on the applicable common law precedents. On the other hand, you can protest against the laws of the United States all you want, but I doubt that they’re going to listen to a bunch of foreigners. re: foreigners? – There are *fifteen* high-profile local groups behind this and some very famous speakers. Anyone who uses the internet should be concerned. I agree – but there’s no cause for concern as yet over the HK legal system is there? And as foreigners we can be concerned as much as we like about the laws of the USA but basically they’re none of our business. The USA is a democracy, the people have elected people who have enacted laws. If they American people don’t like the laws then it is their right (indeed, perhaps their duty) to protest. If people who aren’t American don’t like it then pretty much all they can reasonably do is not use American systems. I think it’s the height of irony that Facebook is being used to organise this protest! Sorry – misunderstood – I thought you meant expats/locals as opposed to foreign to the US. Ip’s comments are ’cause for concern’. This is a rally to support Snowden and show solidarity. Why so against it? It’s not a protest, we want to ensure HK law is indeed upheld. Analysts are split on whether it will be. Snowden specifically chose HK for its tradition of protest and free speech – we are demonstrating this (in line with a similar rally in New York on Monday). We had speakers, groups confirmed long before FB launch. It’s not ironic – what’s the alternative? I have no problem with a show of solidarity with Snowden; society needs whistleblowers. But as a slogan “No extradition” seems to me to be an attempt to subjugate the HK Legal system to mob rule. Either you trust the HK legal system or you don’t. But I don’t see how, at this stage, “Uphold HK Law” and “No extradition” are compatible. The way to uphold HK law is to let due process run, not to try to preempt it by mass protest. The irony is that the tool you are using to organise the gathering is essentially a tool of the CIA (they shut down their own attempt at a “database of everyone” system when they realised there was no way they could do a better job than the information people volunteered on FB and just hooked into that instead). Bruce Schneier is a leading writer on these issues in the US (and also happens to be British Telecom’s Chief Security Technology Officer). No, we don’t trust the HK legal system because: Only last year HK extradited a Libyan dissident at the request of the UK & UK – he had no trial here, he was then tortured. The fear is Snowden will end up like Bradley Manning. And Regina Ip has recommended he leaves immediately. There’s no irony or attempt at ‘mob rule’. I’m sorry, but if this isn’t an attempt at ‘mob rule’ then we obviously have different understandings of the term. What exactly is that you want? That the laws of HK be upheld? Or only that they be upheld if they result in the answer that you would prefer? If the former then let the legal process take its course. If the latter then your “Uphold HK Law” banner is an outright lie. When Edward says “let Hong Kong decides my fate!..” I think we should protect him. That is all Hong Kong people should do. This is enough. 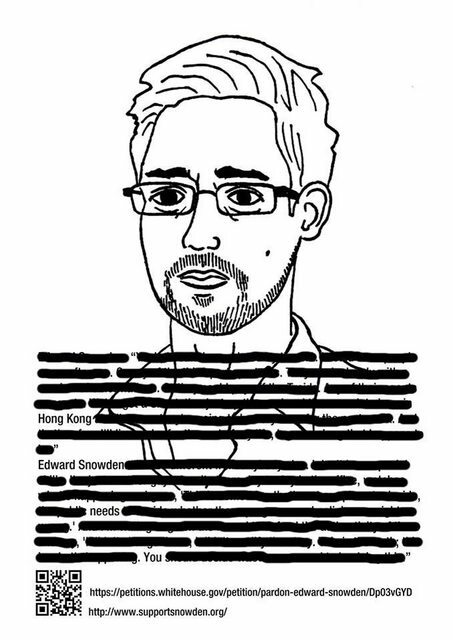 I THANK YOU HONG KONG FOR SUPPORTING EDWARD SNOWDEN. HE IS A TRUE AMERICAN PATRIOT AND OUR CONGRESS ARE THE TRAITORS. There’s much to be worried about Hong Kong’s legal system, its integrity does not match peoples perceptions. However the danger here is that this is now about Snowdon, not PRISM and the vast intrusion into the lives of innocent people across the globe. Already within a week the world’s newspaper headlines focus on Snowdon and his future – not the the real story. Support Snowdon but keep the focus on the real story or his efforts in exposing the vast data trawl will have been wasted. Given the revelations about war crimes, by Bradley Manning, the continuing use of drones on foreign soil and the massive breach of privacy (internationally) by the United States it is clear that they do not respect or adhere to International Law. They have become a rogue state. If Hong Kong respects its obligations under International Law it will refuse extradition. It is interesting that you use the phrase “due process” – was due process applied in the wanton killing of over 800 civilians by USA drones? No, the only irony here is that the USA government is attempting to assert some sort of moral high ground. thanks for supporting snowden HK! Taiwan is waiting as “Far East Switzerland” to receive Edward. Can someone let him know this? Enough is enough, Edward. Take a time out before you trip over your d|ck and get run over by a garbage truck. Safe conduct to Taiwan will be made available. Pop out of your foxhole and listen for a strange whistle in the wind. It will sound like a seagull. HK does not want the troubles you bring, they have enough of their own. Head for the “not-quite-a-real-country” but still independent, ROC. I have friends here. They understand. Get him to Taiwan. I’m waiting to put him into “quarantine”. Yes! Finally someone writes about hunting big non-endangered. to be at the net the simplest thing to bear in mind of. thus it’s nice to read this webpage, and I used to visit this blog all the time. Pretty portion of content. I just stumbled upon your blog and in accession capital to assert that I get in fact loved account your blog posts.